With home-grown innovation and ABB robots, MPI, Inc. has discovered the secret to incredible increases in productivity and quality for today's most competitive foundries. For everything from the most advanced surgical implants and single crystal jet engine turbine blades, to NBA championship rings, the investment casting industry has a major impact. Also known as lost wax casting, the technology has been around for thousands of years and has played a huge role in the industrialization of the world. The process begins by creating an identical wax pattern to the product you want to create. Dozens of these wax patterns are then attached to a runner that is subsequently dipped in a ceramic slurry. Once the ceramic dries, the wax is melted and removed leaving perfect molds of the product. These ceramic molds are then filled with a molten metal. Finally, after the metal hardens the ceramic shell is removed, leaving perfect metal copies of the original wax pattern. Although investment casting has been around for eons, its fundamentals haven’t changed all that much—and neither has the certainty that a quality metal casting is heavily dependent on creating the best possible wax pattern and runner assembly. Over its 41-year history, the family-owned MPI, Inc., based in Poughkeepsie, New York, has made it a priority to create innovative wax room equipment that accomplishes just that. Traditionally the industry has been extremely labor intensive due to the detailed nature of wax runner assembly. Although the shell room—where the wax assemblies get dipped in a slurry of ceramic—has been automated with robots for quite some time, the idea that the intricate work of placing each pattern on an assembly can be done using robotics is a relatively new concept. With manual human assembly, there are errors and inconsistencies which result in inconsistent assemblies and increased scrap. MPI has long been the worldwide leader in wax room equipment and innovation. In order to realize the ultimate goal of a fully automated wax room that would result in higher productivity, lower waste and unparalleled levels of quality, MPI knew it would have to turn to robotics. Initially, MPI collaborated with Rensselaer Polytechnic Institute and the New York State Energy Research and Development Authority (NYSERDA) to create a system based on 3-axis Cartesian robots. However, the restrictions of those robots eventually limited the creativity of MPI's engineers and they decided to search elsewhere for new solutions. MPI’s goal was to create a next generation pattern assembly prototype using robotics. An exhaustive search for a robotics partner led MPI to ABB due to its well-known robot reliability, global reach, and technical know-how. In addition, MPI found that ABB was ready and willing to help solve even the toughest problems. As a result, MPI quickly became a fully authorized integrator of ABB. For customers who are not yet able to automate their facilities or are running out of capacity to handle their current production demands, MPI offers in-house contract pattern production and assembly services. Not only has this created an additional revenue stream, but MPI has found that providing in-house production provides a unique opportunity to further their research and development efforts. It also allows customers to experience first-hand the undeniable benefits of automation. It was this direct and highly involved experience that led to the creation of the new MPI Model 20-14 Automated Pattern Assembly System (APAS). 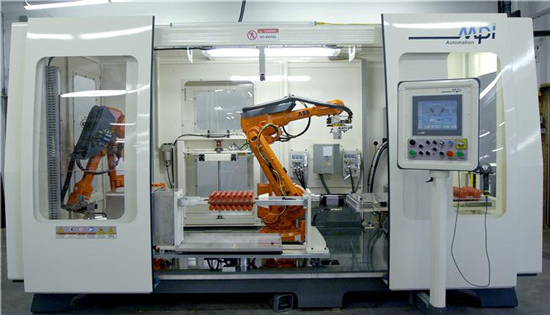 Based on two ABB IRB 2400 6-axis robots instead of the three axis Cartesian system of the Model 20-10 it replaces, the 20-14 can weld 25% larger wax assemblies, is capable of multi-plane welding for advanced products such as single crystal turbine blades, and increases casting yields by 10-30% depending on application. Compared to manual wax pattern assembly, the 20-14 creates incredibly high quality fusion welds that are perfect 100% of the time. It is able to accomplish this all at a rate approximately 2 to 5 times faster than manual assembly allowing for high throughput on deliverable products. The 20-14 is also much more flexible than conventional assembly due to its quick change tooling with less than 1 minute changeovers. Whether the requirements are high volume or low volume, or a combination of both, the MPI 20-14 can be easily integrated into a fully automated wax room. Robotic automation also solves the traditional problem of finding employees with the necessary skills and abilities to create good quality welds for wax runner assembly. Once a recipe is programmed into the MPI-designed user interface, it is easy for an operator to choose the appropriate recipe for a given wax assembly. In fact, an individual can be trained how to operate the machine in less than one day—an amazing accomplishment in-and-of-itself. In order to remain competitive in the modern investment casting industry, it seems clear wax rooms will need to be automated. With MPI’s innovative plug-and-play systems that change is less daunting. For more information please visit www.abb.com/robotics to find the contact information for the ABB office in your area.